Do you want to get involved this school year? Do you want to meet new students with similar interests that have both "Been there" and "Done that?" 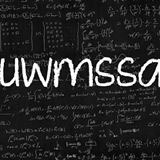 In hopes of maintaining a strong community of students within the Math and Stats departments, The University of Winnipeg Mathematics & Statistics Student Association (UWMSSA) provides an opportunity for UWinnipeg students to interact with both their professors and peers in a fun, laid back environment. We welcome anyone who is either majoring, minoring, or just generally interested in mathematics or statistics. We provide problem solving workshops, seminars, pub-nights, and much more!